Cirius Silicone Pigments adhere to both tin-based and platinum-based silicone surfaces when combined with Cirius Paint Medium. Cirius Silicone Pigments are available in 11 great colors, including "Quinn Blush," a special color developed in collaboration with renowned doll sculptor Terry Quinn to add skin blush in "rebirthing" dolls, an art form that is gaining great popularity among doll sculptors and crafters. Quinn uses this shade to apply just the right amount of blush to doll cheeks and lips to transform a silicone doll into a realistic baby. Although Cirius Silicone Pigments are most often used extrinsically to paint the silicone surface after it has set, they may also be used intrinsically as a dye by adding them to the silicone base before adding the catalyst. For this purpose, a small amount of pigment goes a long way. 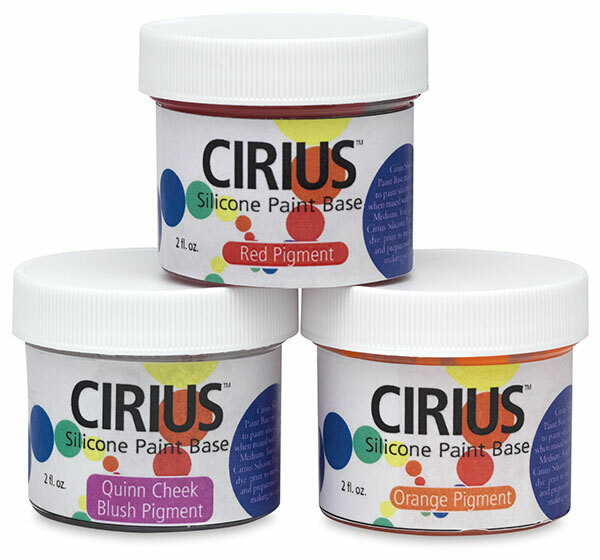 When used as a dye, paints made with Cirius pigments only work with tin-based silicones, as adding the pigments to a mixture of platinum silicone will interfere with the setting of the rubber. 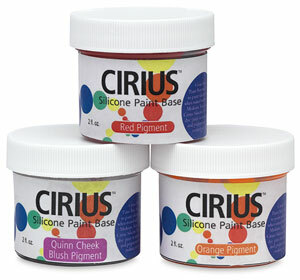 Paints made with Cirius pigments may be thinned with Cirius Silicone Paint Medium. ™ Cirius is a trademark.